We have collected some of our exclusive images featuring spectacular interior designs of kitchens and created the following gallery which we believe will be a memorable one. In the image gallery below you will find some striking decoration and design ideas for kitchens which we are sure will inspire your next project. The kitchens illustrated below have some unique elements that you don’t find easily in every-day kitchens. You will find some special cabinetry designs, great countertops, magnificent kitchen islands, nicely decorated dining areas and much more. So, please enjoy the kitchen ideas below and we hope you will find something useful for your own kitchen decoration. 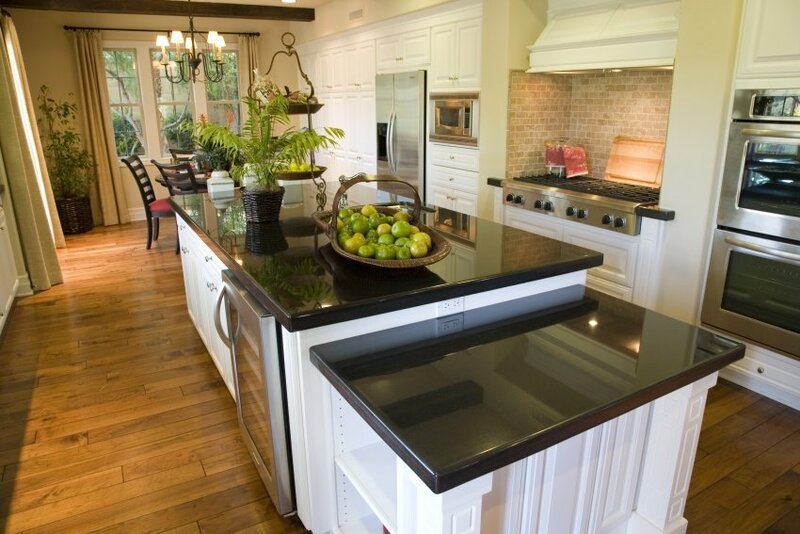 Here is an example of a traditional kitchen design in a classic black and white color combination. The whole set is topped with grey granite; its reflective surface adds a nice contrast to the matte finish of the cabinetry. 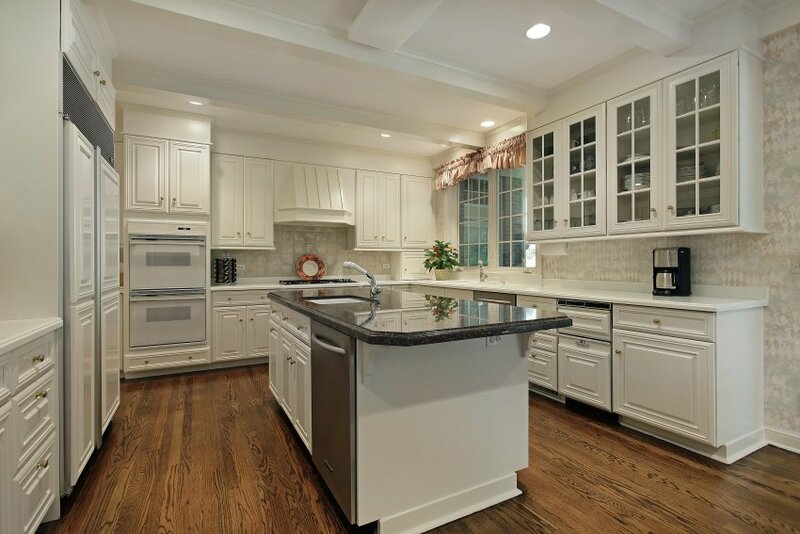 White is a pretty popular choice when it comes to kitchen design. In order to add individuality to your cooking area and spice it up a little, you can apply a bold color, such as bright yellow, to the walls. 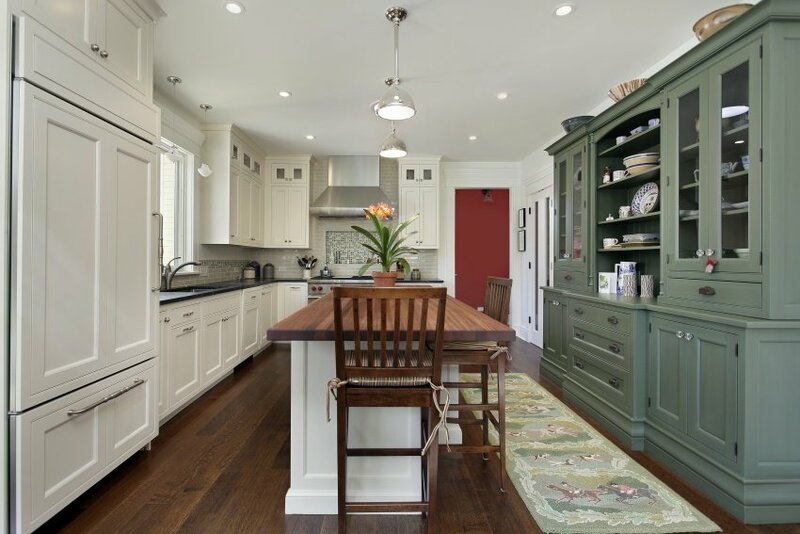 Red hardwood floors will add the final touch to a warm and cozy setting. 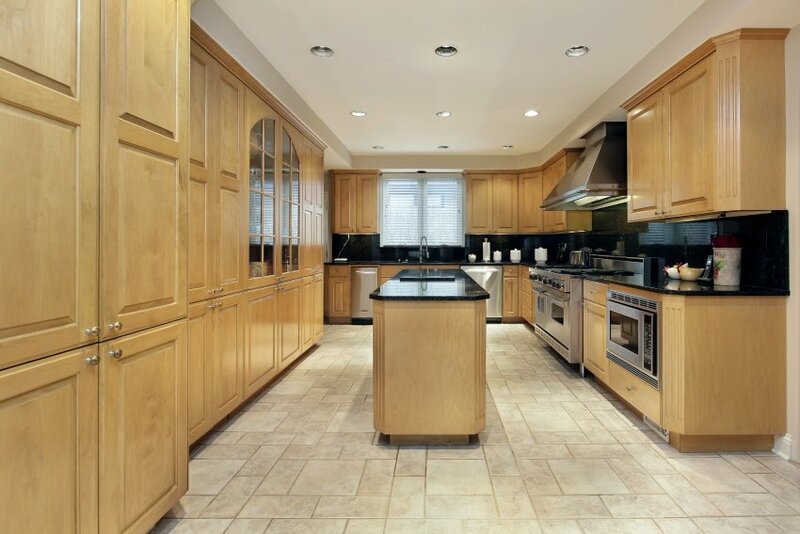 This high-end kitchen is organized around a centrally positioned island counter. The floor is tiled accordingly with a decorative pattern right in the middle. As for the color choice, dark red wood and golden ornaments (against a neutral beige background) give you a sense of luxury and splendor. Red colors are known to trigger a person’s appetite. 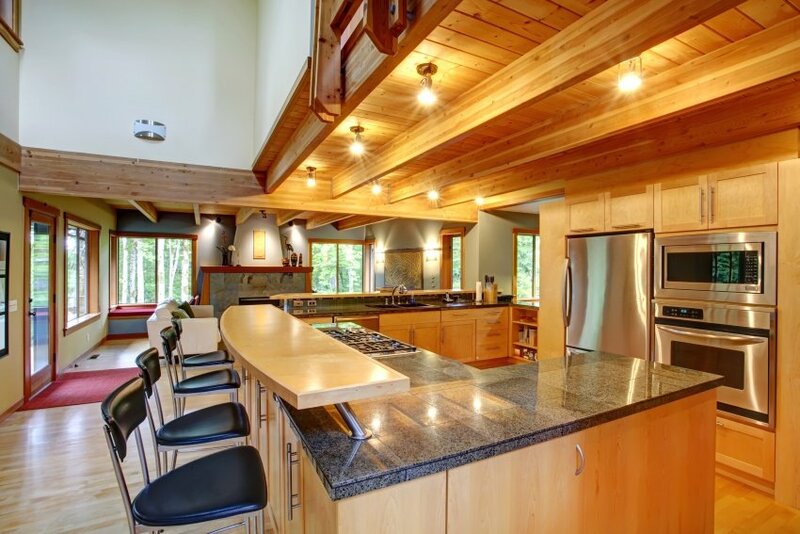 This redwood U-shaped kitchen design with an island counter truly is alluring. 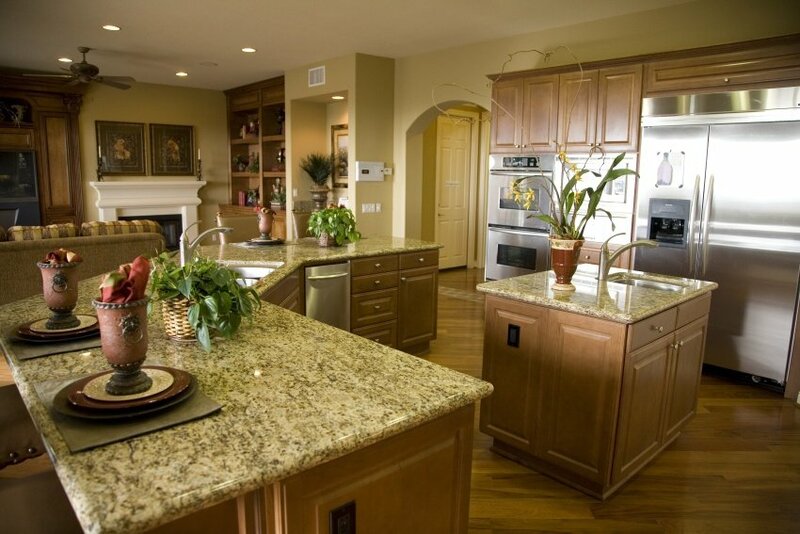 Beige stone countertops look good and are nicely harmonized with some travertine floor tiles and light wall paint. 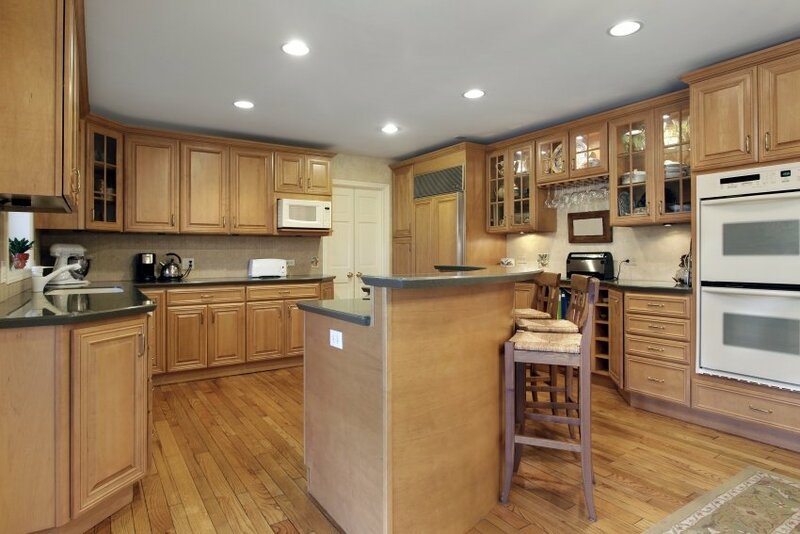 A traditional caramel-colored kitchen design is especially appealing with a checkered floor and beamed wood ceiling. It is always a good idea to have a window by the sink to overlook the surroundings while doing your daily routines. Light grey kitchen counters fit underneath a red brick arch awning. A central island counter is nicely decorated with classic ornaments. Wrought iron bar stools and adjustable pendant lights are particularly charming. 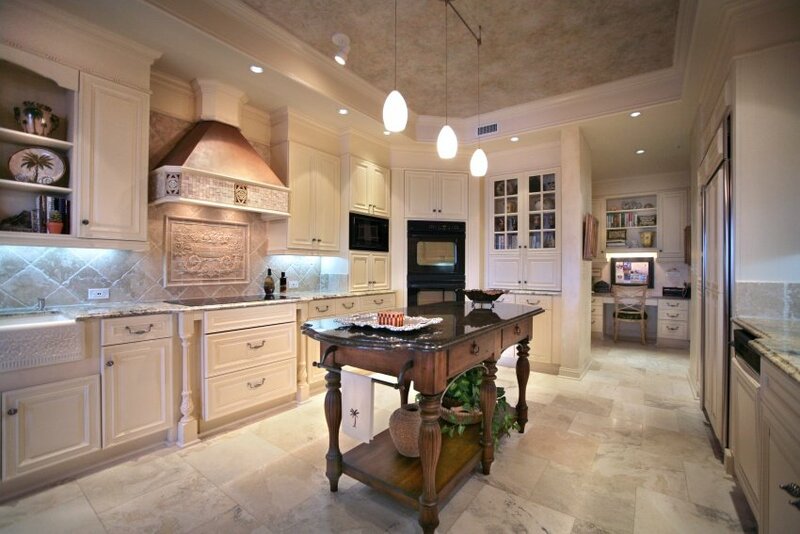 This is Tuscan style kitchen remodel. Here is a modern interpretation of a classical kitchen with a dining area. Lavish ornaments and contemporary details come together to create an exclusive design. The furnishings are set in chocolate hues that stand out against floors and walls in shades of white. 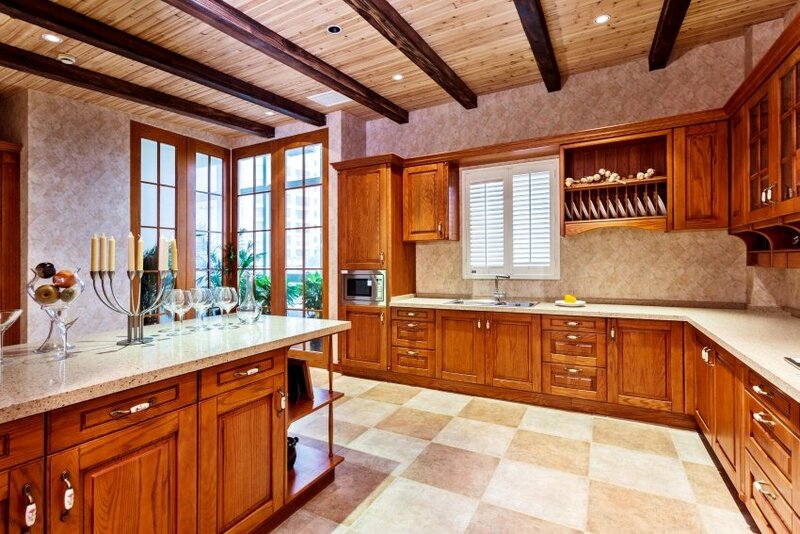 A traditional kitchen set in wood inspires a sense of comfort and warmth. A nice bar counter is a great place for the whole family to gather around and have a quick snack, or watch the master chef cook a favorite homemade meal. Classic meets modern in this fascinating kitchen design. 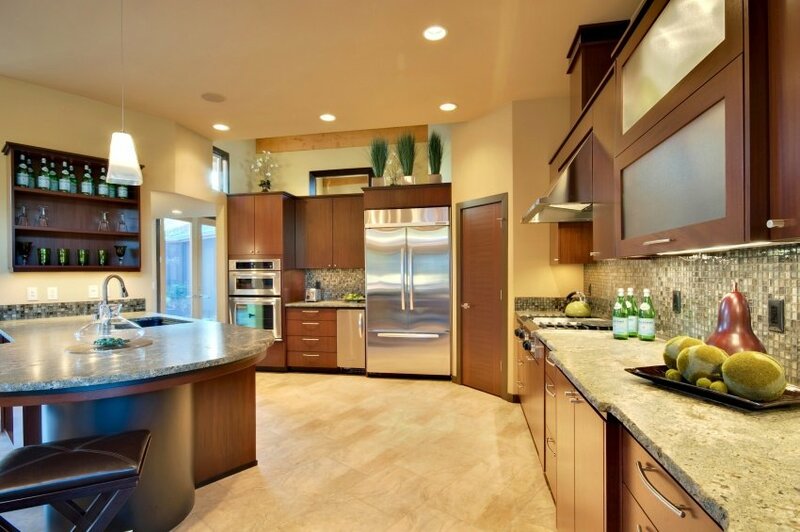 Dark wood, speckled granite and stainless steel are the key elements that put together a high-end layout. Accessorize it a little with plants and pottery to make it even more appealing. A white kitchen inspires a sense of purity and simplicity. Dark wood agrees with it, providing some nice contrast and a warm feel. A kitchen cupboard in distinct grey is as fancy as it is convenient and practical. 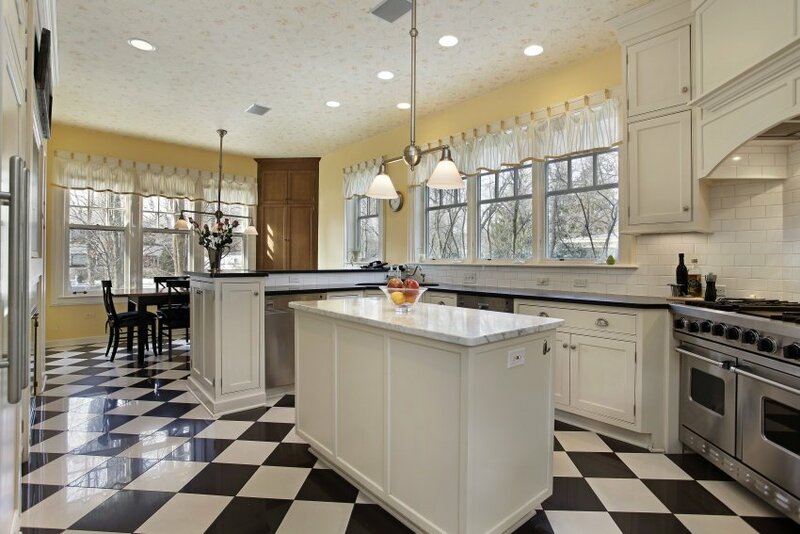 White cabinetry with black countertops sit well on a checkered floor of the same colors. Yellow tinted walls add a surprise twist to an otherwise achromatic color scheme. A dining set in black fits in the whole scene just fine. A white kitchen set with floor-to-ceiling cabinets enclose a dark-colored island counter that blends in with a hardwood floor. A color burst in bright green is a nice idea when you want to break a traditional color combination. 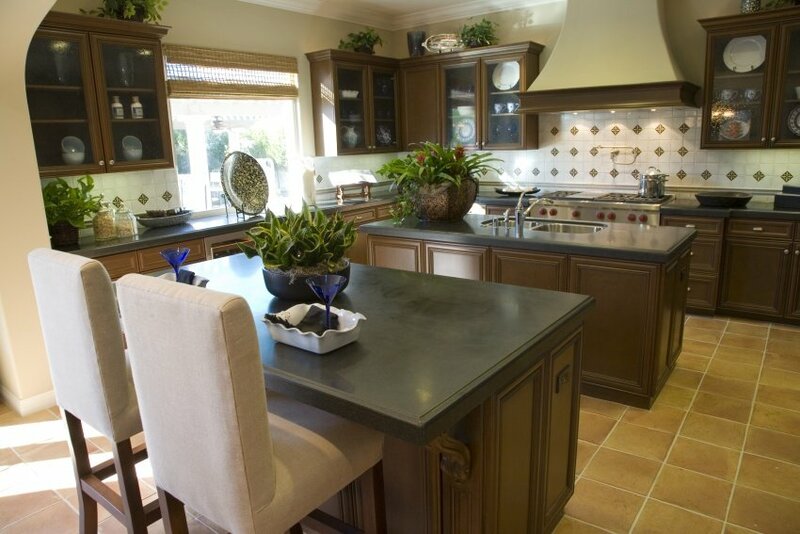 This transitional style kitchen brings together timeless beauty with modern trends. 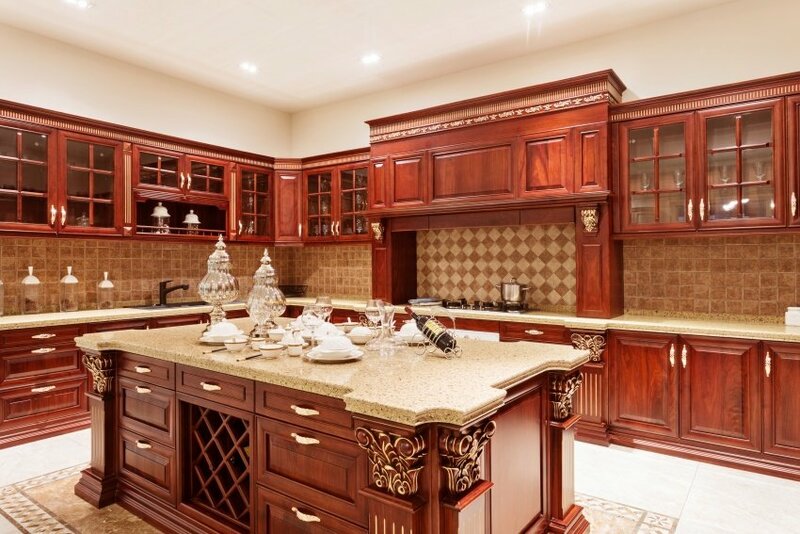 Traditional materials (such as wood and granite) are delightfully combined with stainless steel, and ornate details are mixed with minimalist design. It is fascinating how opposites match together so well. There is a certain appeal to an all-white kitchen. Light colors are the way to go when natural sunlight may not be abundant, as is the case with this setting. Proper choice of color and illumination let this kitchen corner fit in nicely under an upper floor space. A monochromatic color scheme never goes out of style. 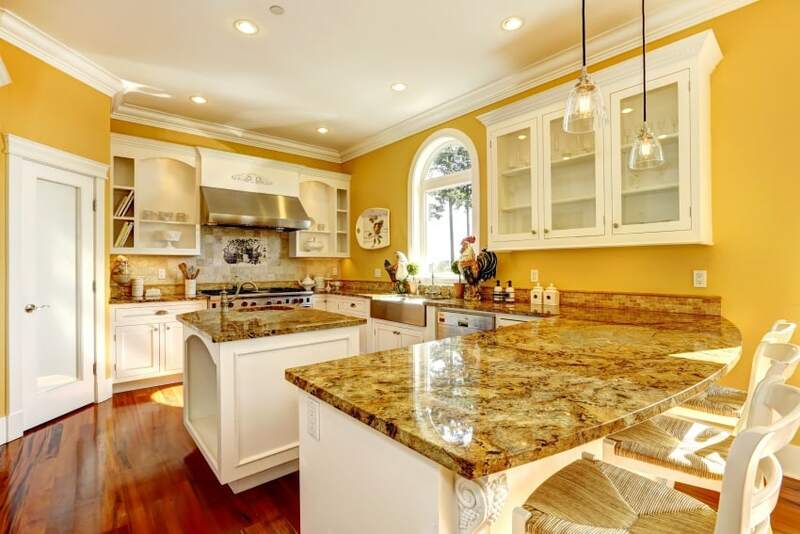 This kitchen set in shades of beige looks elegant and stylish. It is composed of big cabinets and a few freestanding counters, which gives you a perfect balance of storage space and work surface area. 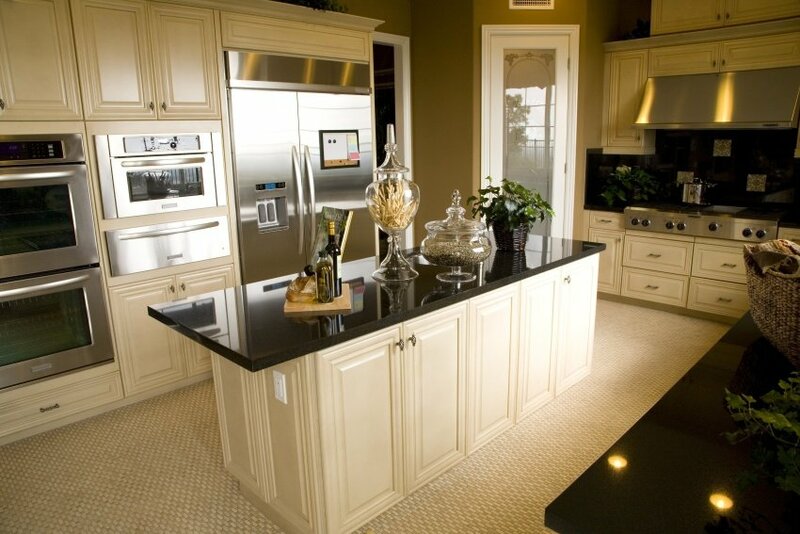 A kitchen in ivory and black quartz looks sleek and clean. This fabulous design idea can satisfy even the most demanding of home chefs. It is equipped with all the best appliances and has a convenient kitchen island right in the center. 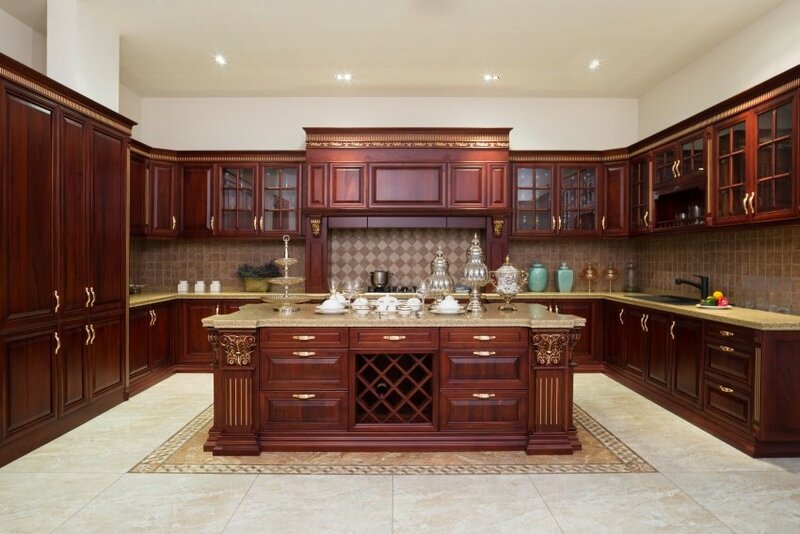 Nothing speaks more of class and luxury than a deep walnut colored kitchen. To really let it stand out in its entire splendor, throw in a little contrast by installing a light granite countertop and cream-toned ceramic floor tiles. 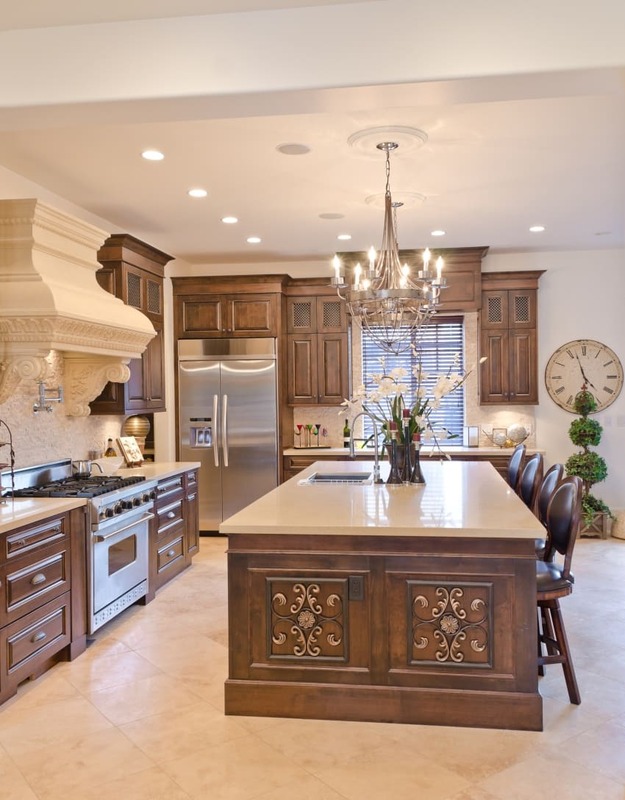 A traditional kitchen design in brown and ecru looks neat and chic. The ornate kitchen island with adjacent seating and overhanging luster is a beautiful focal point for people to come together and share some quality time with each other. Here is another design proposal in warm earth colors. 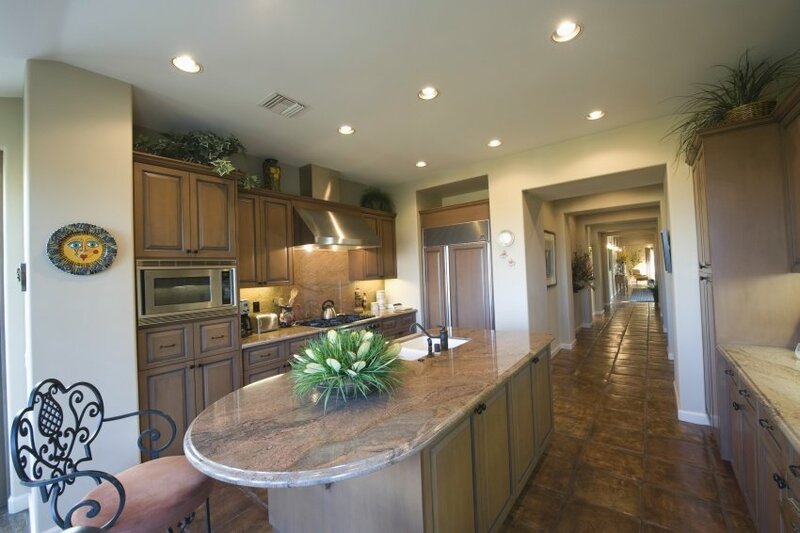 This spacious kitchen is as beautiful as it is convenient. It literally has it all – lots of space to store cooking gear, glass cabinets to show off crystal sets, wine racks and glass racks, and all the best of built-in appliances. This kitchen layout with an island counter is set in natural oak and black quartz. Both materials come together elegantly along with a dash of stainless steel and some wood-framed glass. 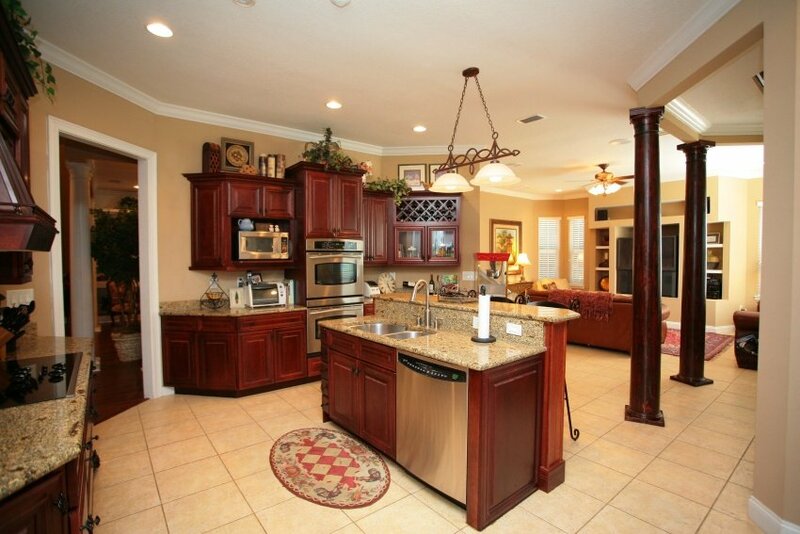 Here is a parallel kitchen layout with a central kitchen island. 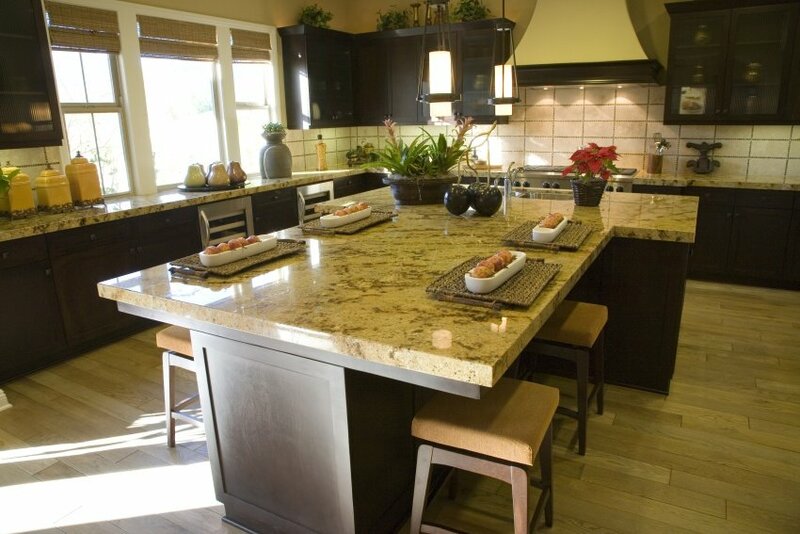 Cabinetry is beautifully crafted from natural wood and topped with a speckled granite countertop. A textured brownish tiled floor fits in the monochromatic color palette nicely. 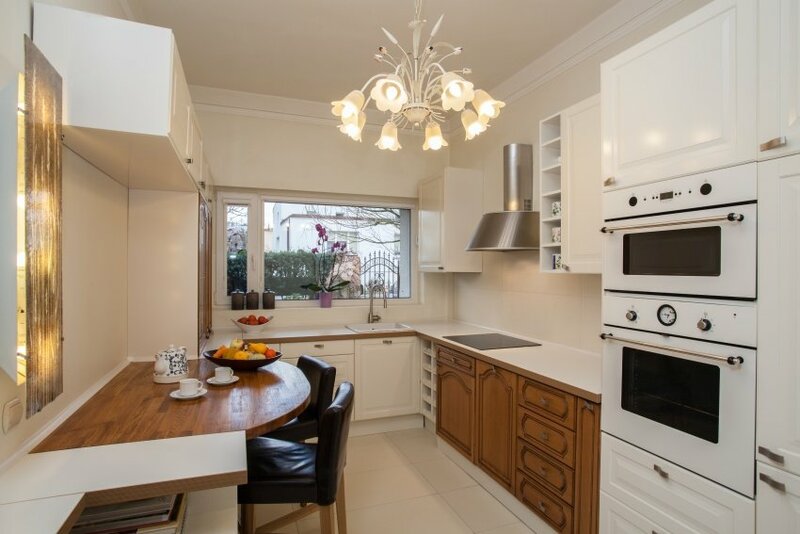 This cozy little kitchen set with breakfast area is set in light colors that make a tiny room look more spacious. A little wood here and there has a powerful effect creating some contrast. Leather black stools are a comfy seating option. 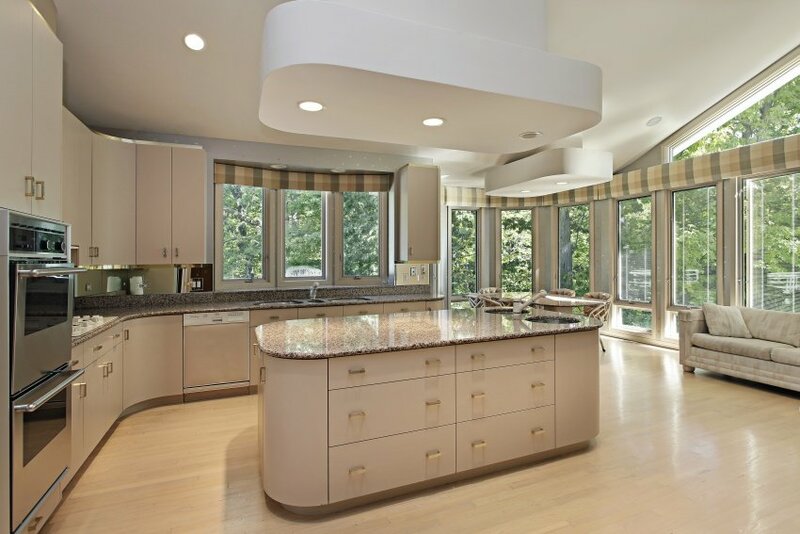 This sleek kitchen design with simple flat-panel doors and curved corners is fascinating. The modern feel is complete with a light wood floor and glossy countertops. High-end built-in appliances are a must for a kitchen of this rank. 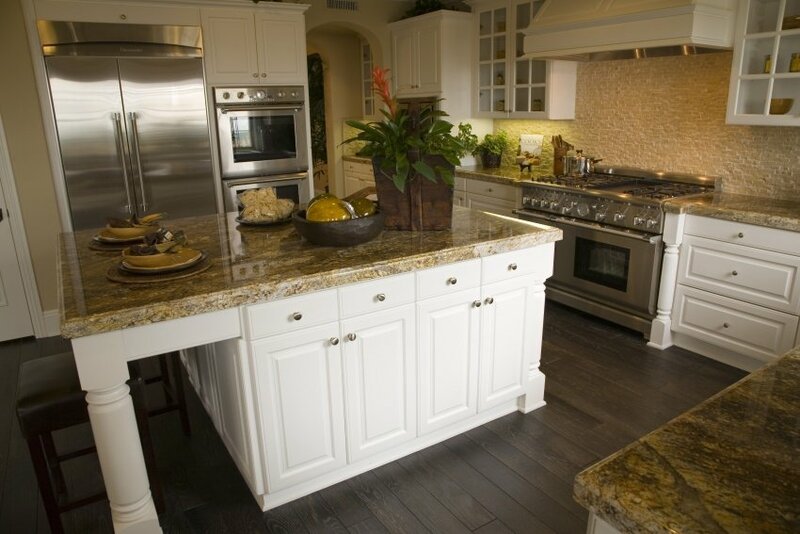 Natural wood, speckled granite and ceramic backsplash are put together to create a homely setting. An extensive glass front comes in handy when you want to exhibit a vast collection of beautiful porcelain and glassware. Barely anything looks as clean as snow-white cabinetry with a few glass fronts to show off some neatly stacked kitchenware. 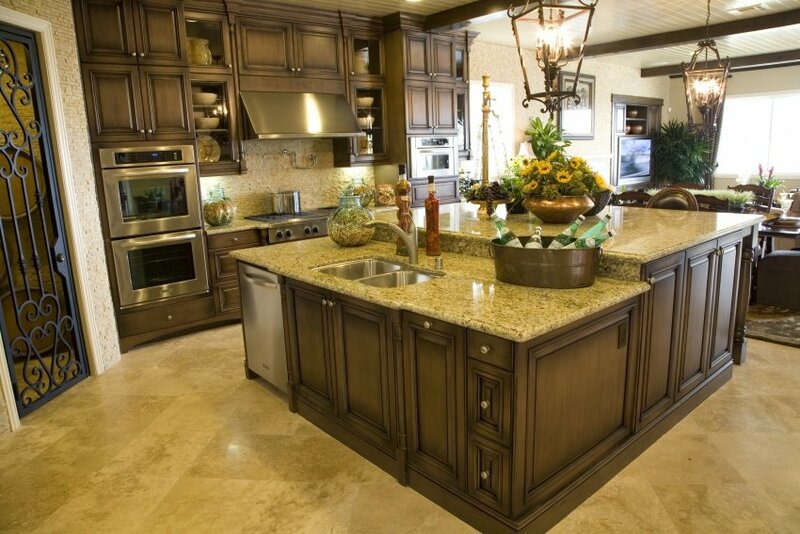 Throw in a nice island counter to utilize the space efficiently, and you are in for the ultimate cooking experience. A modern kitchen, void of any intricate details, can be beautiful and intriguing all the same. In this simple design, a fabulous mosaic backsplash totally makes up for a lack of ornamentation. This is not your regular kitchen – this is an extraordinary design with dark wood cabinetry and light granite countertops. 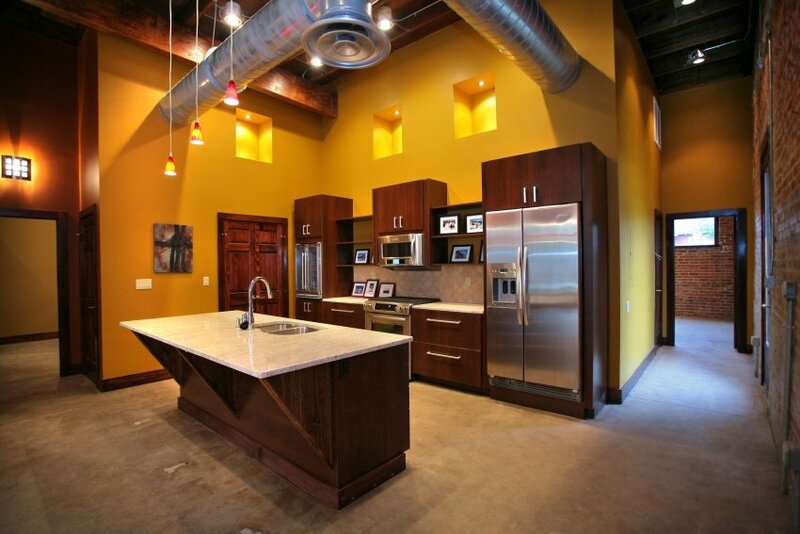 Yellow paint, brick walls, concrete floors and a couple of unconcealed air ducts add some industrial appeal to a modern setting. This design proposal is for an open concept cooking area featuring a bar counter and a kitchen island. The curved edges of the stone countertops are a nice finishing detail, and also safe to navigate around. Lots and lots of storage space and work surface area can never be redundant. 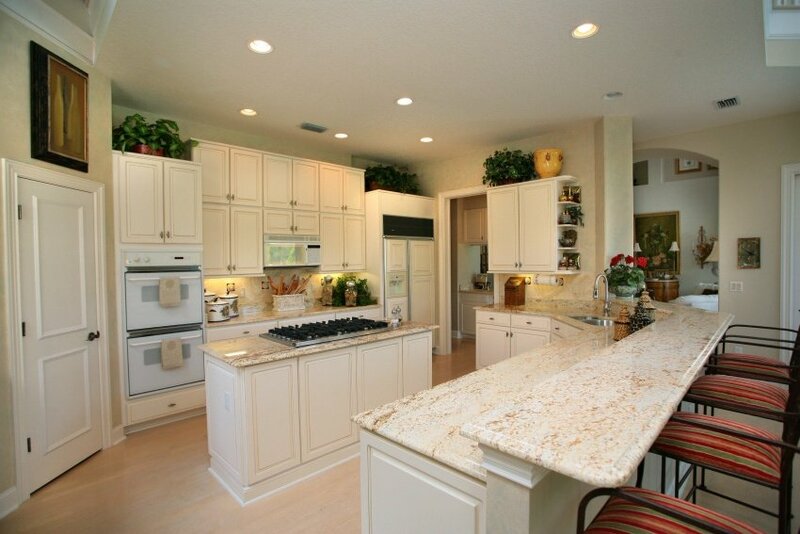 Here is a kitchen layout that gives you just that, and on top of it, looks marvelous in white. 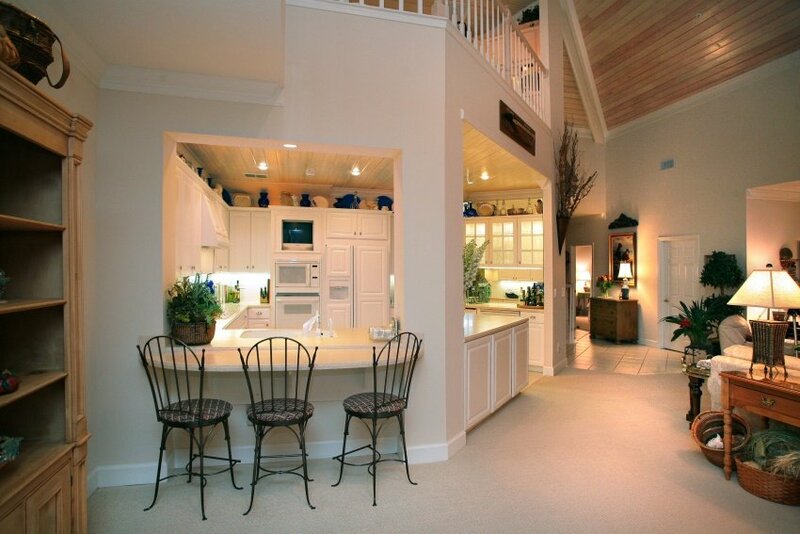 Enjoy yet another open concept kitchen with an island counter overlooking a living room space. 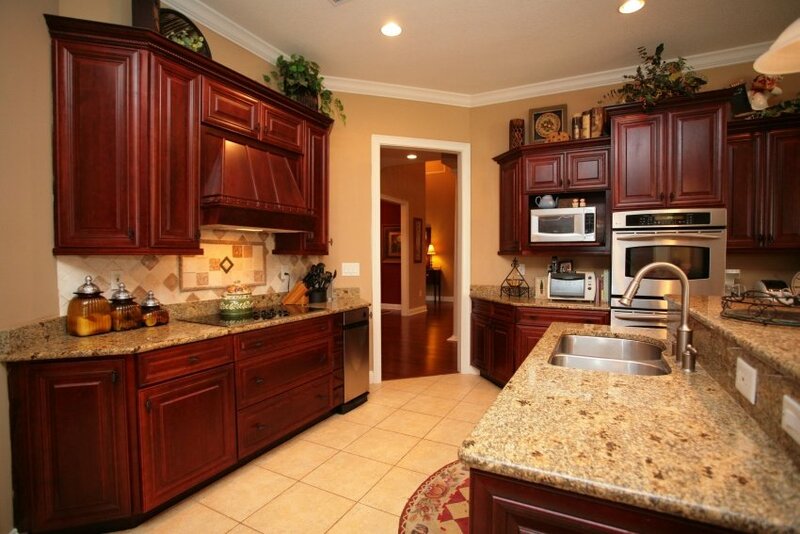 Traditional cabinetry in red mahogany takes on a sophisticated look. Speckled granite and stainless steel are also in the mix. This dark red kitchen set is so vibrant, that beige walls and floors are the perfect neutral background to accommodate it. It is warm and inviting, and with all conveniences included. Feast your eyes on a fabulous eggshell-colored kitchen idea. An intricately designed side table is a creative way to replace a standard island counter, and add character to your cooking area. This kitchen corner set in plain white is anything but dull. Tiling patterns and classic details are sure to catch your eye. Proper choice of decoration puts the final touch to a magnificent design. 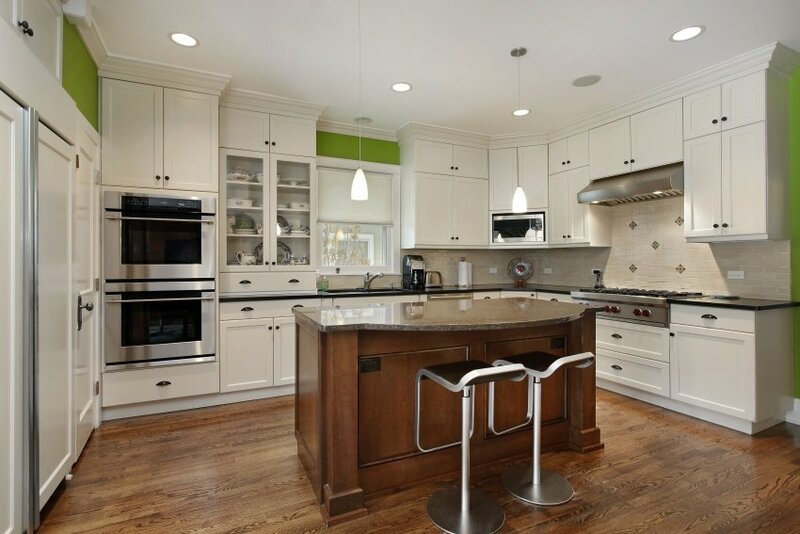 A classic design in white takes a contemporary twist with some glossy black surfaces and stainless steel appliances. 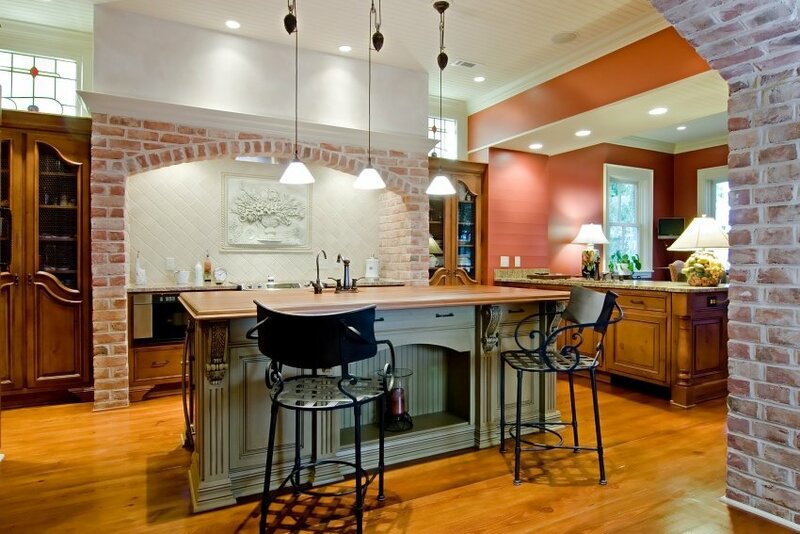 Brick accent walls and hardwood floors will make you feel right at home. 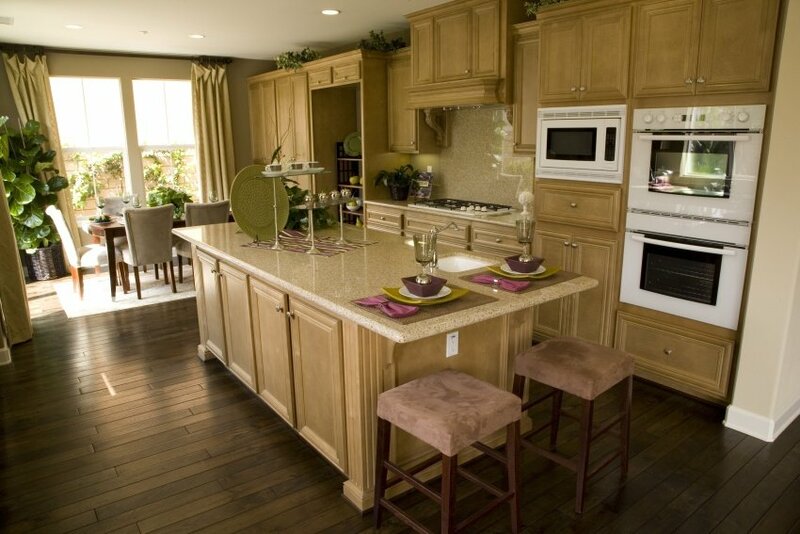 Here is a welcoming kitchen layout with a large island counter. White cabinetry stands out against a dark hardwood floor, and there is a nice distinction between granite countertops and stone-tiled splash-backs, as well. 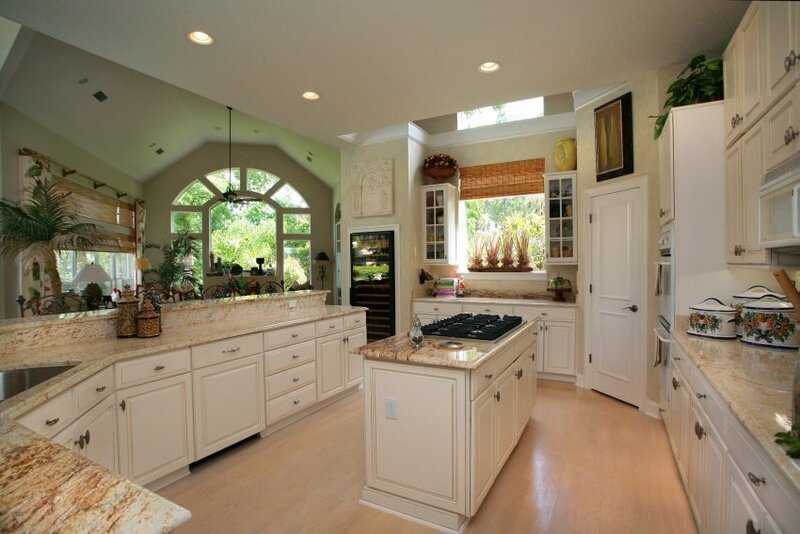 This spacious kitchen layout gives you good functionality and great aesthetic value. Warm earthy tones help establish a cozy setting that is nice and soothing. Spending time in a kitchen of this design will be nothing short of pure pleasure. A kitchen design in dark chocolate hues looks yummy. Black countertops are in contrast to white splashbacks in patterned tiles. 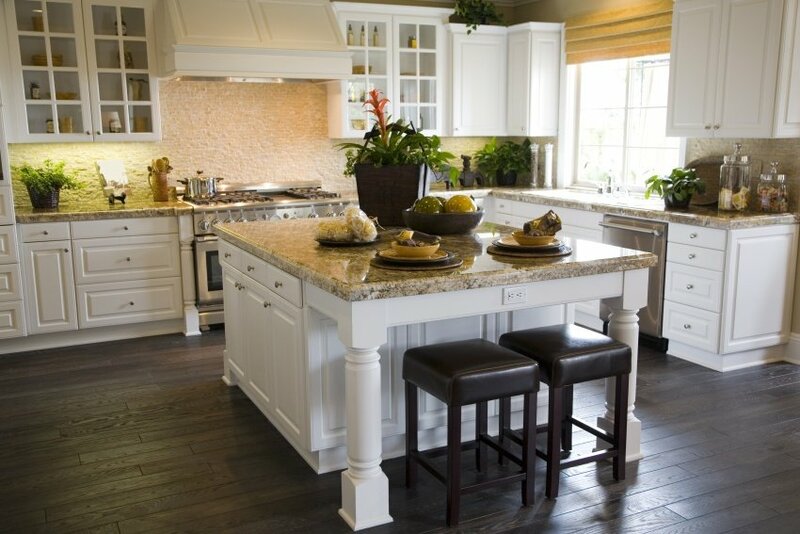 Two freestanding island counters use up the free space in a most efficient way. A sophisticated design in dark wood will always be a smart choice. 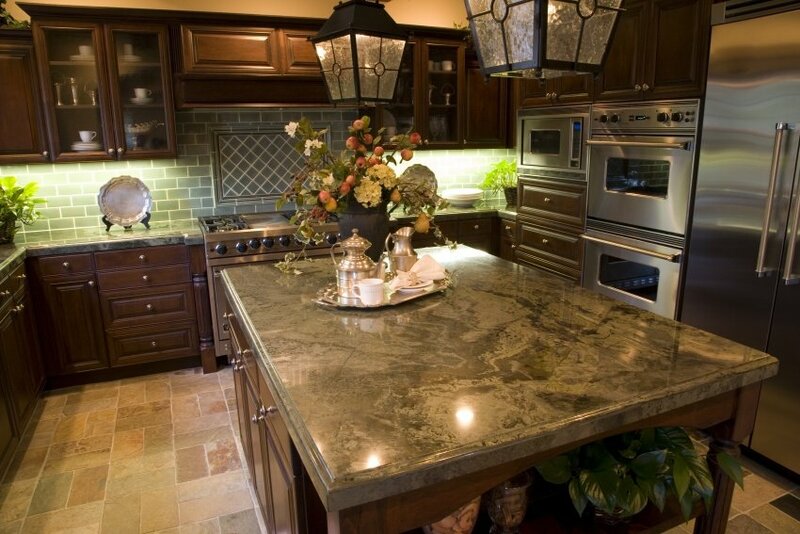 Highly reflective granite countertops add a touch of luster and luxury. 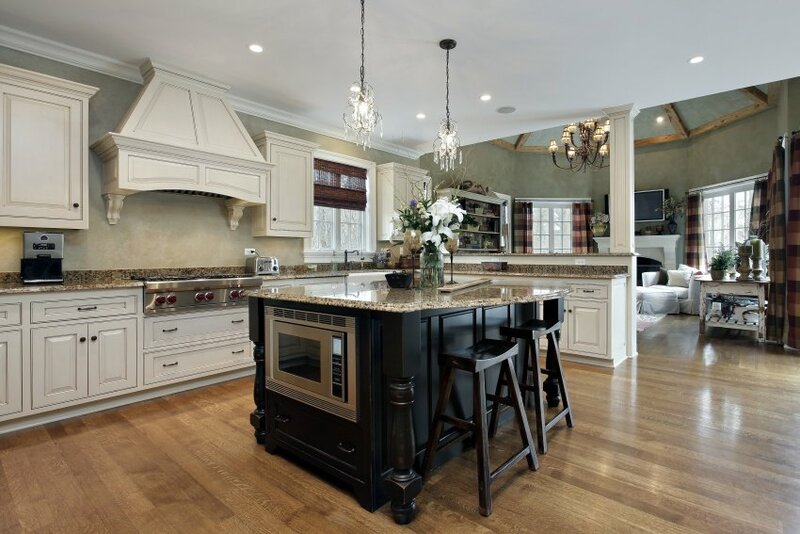 A huge kitchen island, doubling as a dining table, is nicely aligned with a large stove and hood. 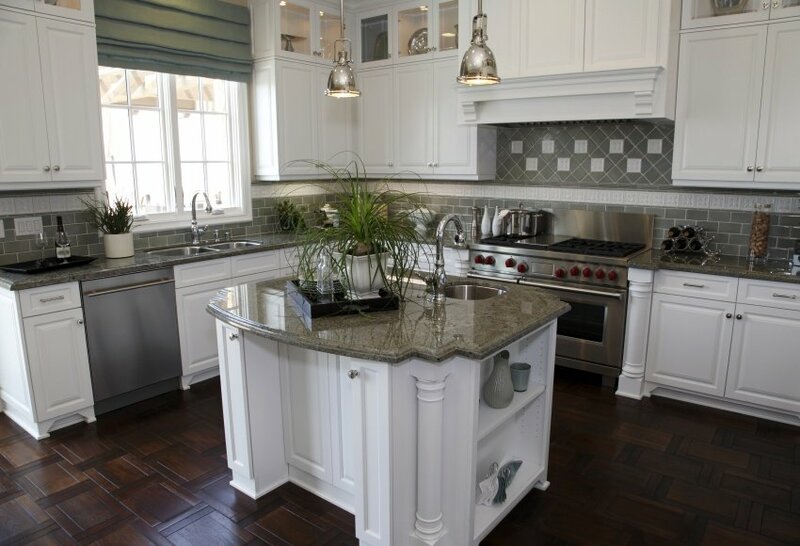 Here is another refined idea for a U-shaped kitchen with an island counter. 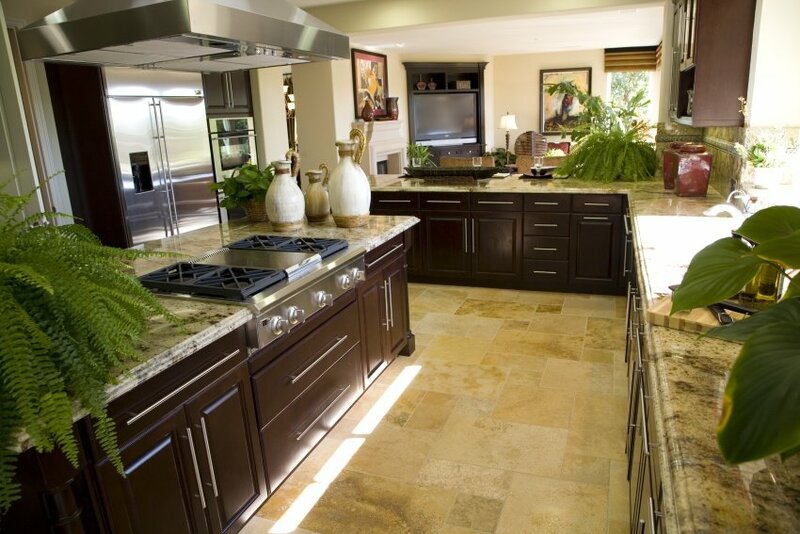 Dark wood, granite and ceramic tiles are in perfect harmony. A brick pattern is a nice way to add some texture and character to your regular splashback. 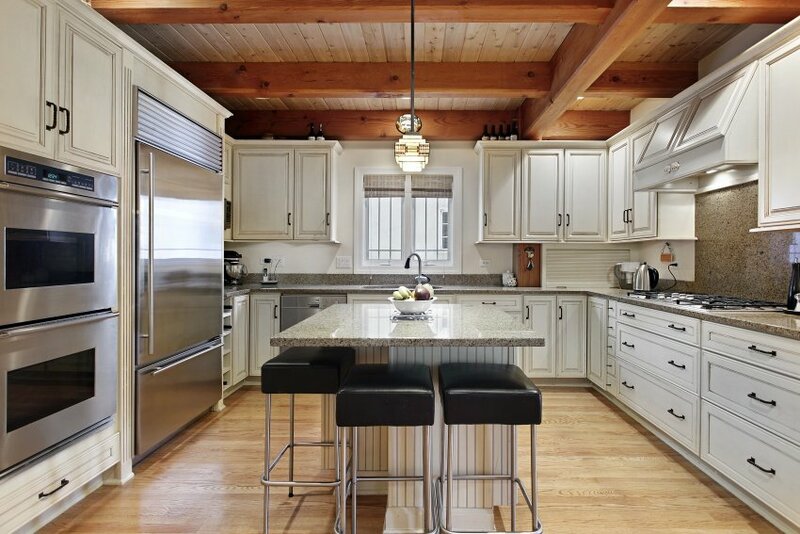 This open concept oak wood kitchen features an island counter with breakfast area, and a dining set by the window. 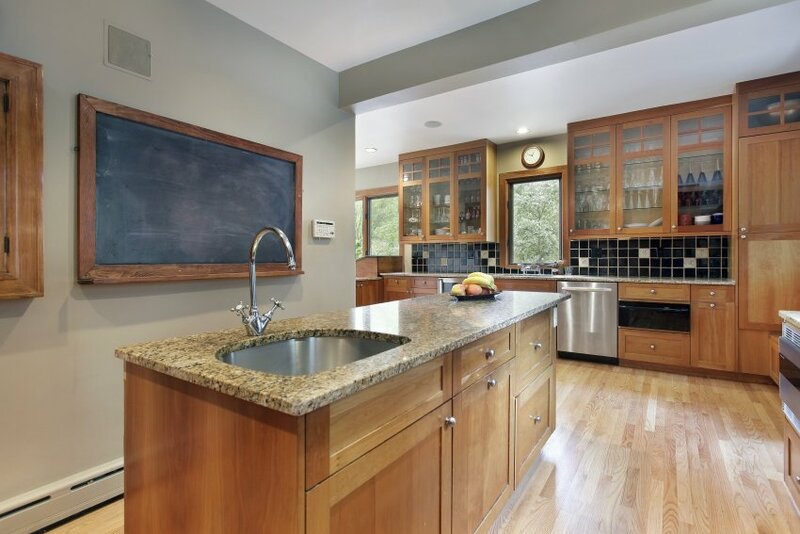 Countertops and splashback in beige granite are perfectly matched with the natural wood appeal of floors and cabinetry.